This monument, placed as centennial remembrance by the Roanoke Chapter of the Daughters of the American Revolution and the WPA in 1936, commemorates the bloodiest engagement of the largely forgotten Creek War of 1836. 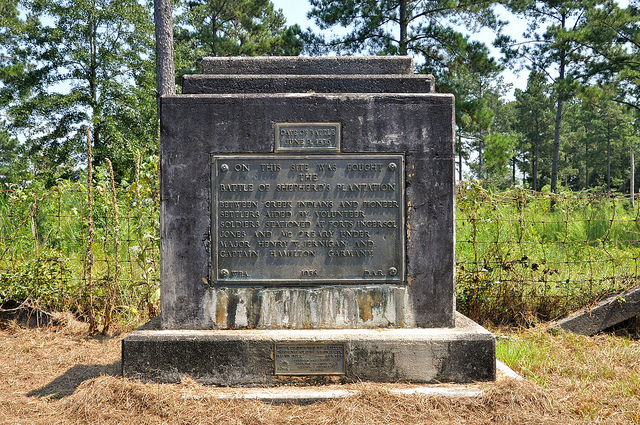 The main text reads: On this site was fought the Battle of Shepherd’s Plantation between Creek Indians and pioneer settlers aided by volunteer soldiers stationed at Forts Ingersol Jones and McCreary under Major Henry W. Jernigan and Captain Hamilton Garmany. A second tablet lists the four Stewart Countians killed in the battle: Captain Robert Billups; Jared Irwin; David Delk; and —-Hunter. [Jared Irwin was the nephew of Governor Jared Irwin].